Here we see how the three fundamental ontologies from POET are woven together. On the right we show the Structural ontology - MACE. On the left the Transformational ontology - MAGMA. Down the middle the Ontology for the fundamental parts of all Enterprises - DOTS. The words in the boxes give some examples of the Structural and Transformational information you would expect to see at each level. 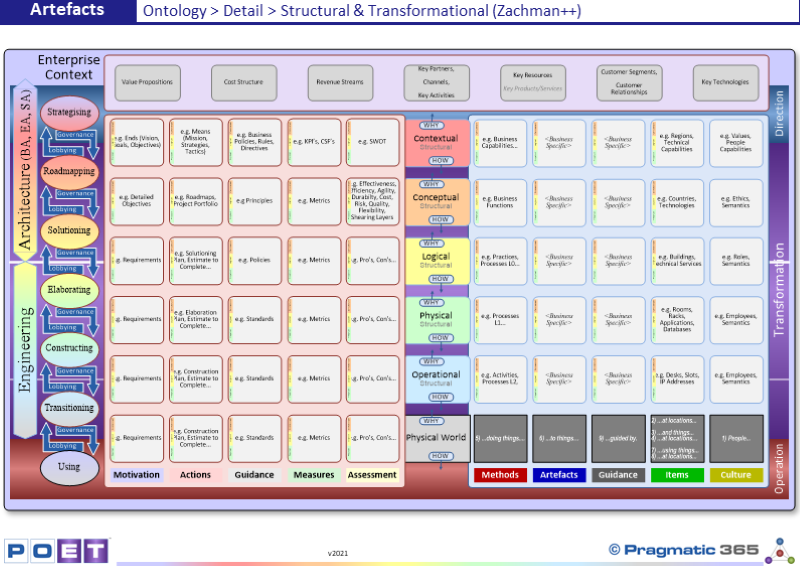 In what way does your Enterprise consider Transformational as well as Structural models at all levels? What ontologies and meta-models are you using? How do they map to, and fit into, the POET Ontology? Are they any gaps or overlaps? If there are gaps and or overlaps, is it useful to know that? What will you do to fill the gaps and remove the overlaps?